Last year was full of busy trips. Our trip to Asia where we explored Thailand intensely. Then flying to the west coast twice, once to finalize wedding plans and then to actually tie the knot. So busy. After an extremely cold winter we were desperate for a change in pace. We were in a much needed trip, where we could just relax on the beach and soak up the sun. 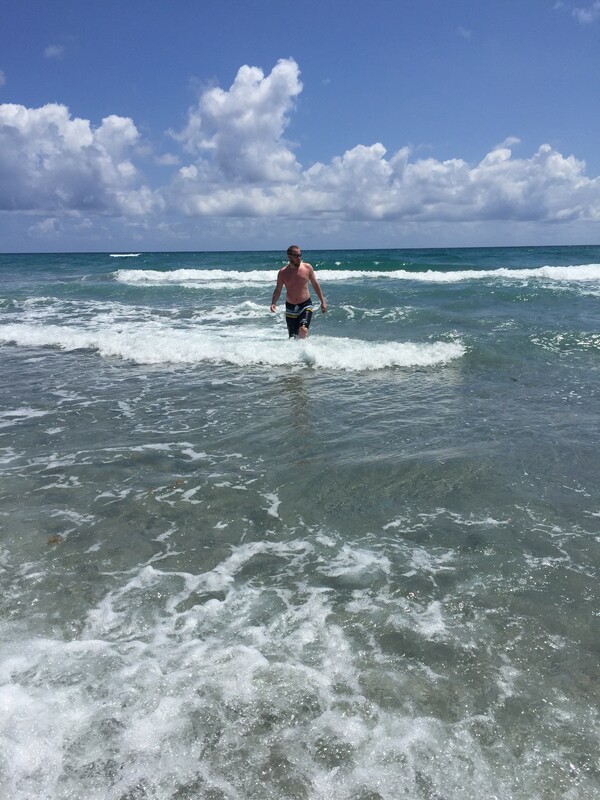 So a week ago, my husband and I headed down to South Florida, for some summer like weather. It ended up being the most relaxing vacation ever. We visited with my husband’s relatives for two days in Del Ray Beach. Del Ray Beach is north of South Beach, Miami. It is a beach town, with beautiful beaches, great restaurants, and tons of shops. It is known to be artsy. We actually went to a wonderful Art festival the day we arrived. After two days of visiting with relatives, we headed to an ocean front hotel, Sands at Del Ray Beach. This hotel was awesome. The set up was quite nice. They had valet parking. The pool and restaurant overlooked the ocean. Every morning, we would wake up and head straight for the beach. The hotel provided towels, chairs, and umbrellas. There was also a server that would come around to take your order, and bring you whatever you needed. I was pretty obsessed with the lemonade. The beach was gorgeous. It was 85 degrees most days. The sun was shining, but there was a refreshing breeze so I never felt sweaty. The water was calm and cool, but not cold at all. However, after a couple days in the sun, our skin felt like it needed a break. So we took the 2 hour (long way) drive to South Beach, Miami. On the way down, we saw tons of ocean front mansions and expensive cars. Once we were in South Beach, we shopped on Lincoln, and then walked two miles on the beach to Collins- where we did more shopping. After shopping my husband found an amazing Cuban restaurant, for us to eat at. It was delicious. 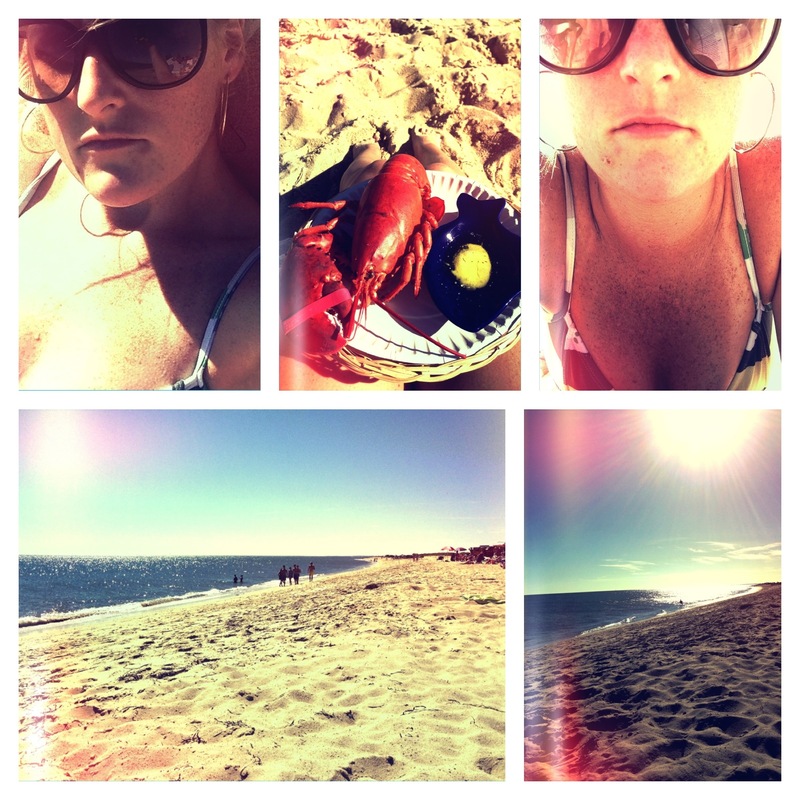 Then back to Del Ray Beach we went. 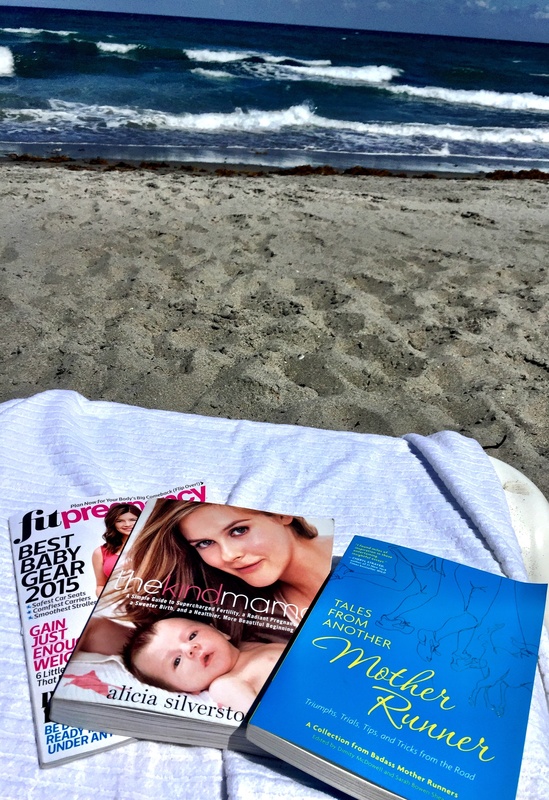 Although, we spent most of the time relaxing soaking up the sun, I also was productive, skimming magazines, finishing reading my first baby book, and starting my second. I skimmed through Fit pregnancy, and started registering. I finished the book, The kindmama, by Alicia Silverston, and started, Tales from another Mother Runner. Very productive indeed. What is up with all the mom books? Well because my body physically will not allow me to hide it anymore… I’m excited to finally share a secret I have been keeping since November. Yep, you guessed it… I have a baby bump! I love my itsy bitsy teenie weenie polka dot bikini at almost 23 weeks pregnant! Thanks – to my husband Erik, for the most relaxing vacation aka babymoon. Menemsha is the beach spot in Martha’s Vineyard where everyone comes in the evening to watch the sunset. There are tons of cool lobster kitchens along the beach so you can have a casual lobster dinner while watching the sky turn orange. East Chop in Martha’s Vineyard is a 3 mile loop that has amazing million dollar beach homes, that sit ocean front. The area doesn’t have any sidewalks, so if you run here, keep in mind that you will be running in the street. However, besides the beautiful homes, and ocean front views, the loop is very quiet. Not very many other traffic or people. It is just you, the wind, and the sounds of waves crashing. If you need to squeeze in some hill work, East Chop is the place to do it. The hills are big and long, but not too steep. I actually didn’t run the loop, but rather ran 2.5 miles and then turned around for a total of a 5 mile run. It was a peaceful place to run. I highly recommend it. Ocean view on the East Chop loop. The road I ran in East Chop. My Newton Shoes running East Chop. Well that is East Chop on Martha’s Vineyard. Have you ever run East Chop? Do you like running around nature or through cities? So on my way up to Martha’s Vineyard, all I could think about was running. If you are a runner you would understand. One of my all time favorite things to do, is explore a new area by running through it. But the Vineyard isn’t exactly a new place for me. I had been there two years ago, and have memories of running the most amazing runs. Runs where I felt so good, that I could keep going. I just couldn’t wait, I was excited about running in cooler northern temperatures. Running with breezes from the beach. Running under sunny clear skies. But most of all running along the coast with breath taking views of the ocean. Finally, it was the first morning of our trip in Martha’s Vineyard. I woke up and immediately put my running clothes on. I had just purchased some new Newton shoes, so I was also excited to get running in them. The running route I took was the same one that I had taken two years ago. I ran down to the Oak Bluff’s harbor ran along the water, and then hopped on the bike path that takes you towards Edgar’s Town. The path has some hills, but nothing to steep. It goes over some small bridges too. It is fun having water on both sides of you. And just how I remembered, the sun beats down on you, while the breeze from the water cools you down. I went 3 miles and then turned back, doing a total of 6 miles. I probably could have gone further. Me running along the coast of Martha’s Vineyard in my new Newton shoes, the Gravity. I am still using the Distance U too, in my rotation. Ocean view from my morning run! So that was my morning run in Martha’s Vineyard. Along the coast from Oaks Bluff towards Edgar’s Town. I ended up running this route twice equaling up to 12 miles. Runs go by fast when you are surrounded by such beautiful scenery. Would you want to run here? What is the prettiest run you’ve been on? I haven’t been posting any running blog posts because I am in Martha’s Vineyard and I have been using my camera not my iPad. However, I have been running every morning, and I do have plenty of amazing photos to post. 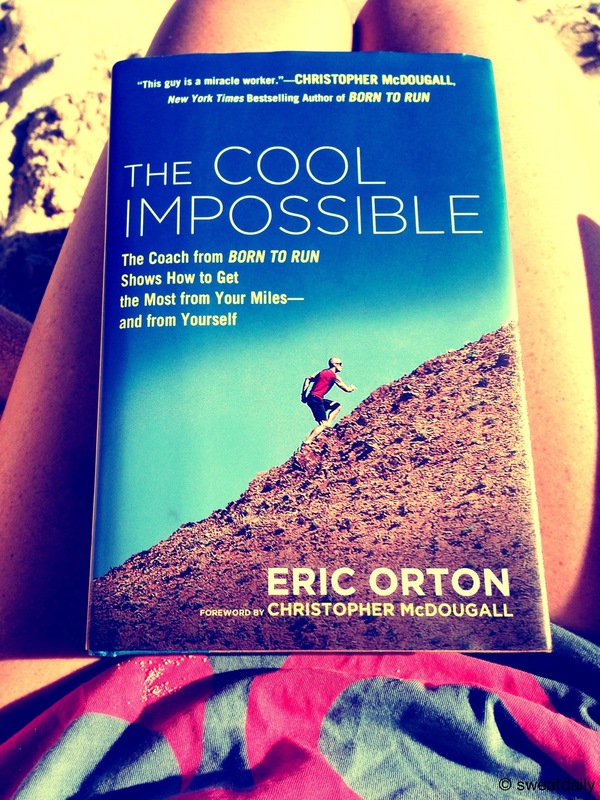 I have run two different amazing coastal routes that I can’t wait to share with you. But for now I wanted to show you this photo of little neck clams. On the vineyard there are plenty of cove like places where you can go clamming and crabbing. This year the tide was too high when my boyfriend and I wanted to go, but we went lat year and it was really fun. The best part of clamming and crabbing is eating the seafood after you went out there and caught it yourself. It taste so amazingly fresh! 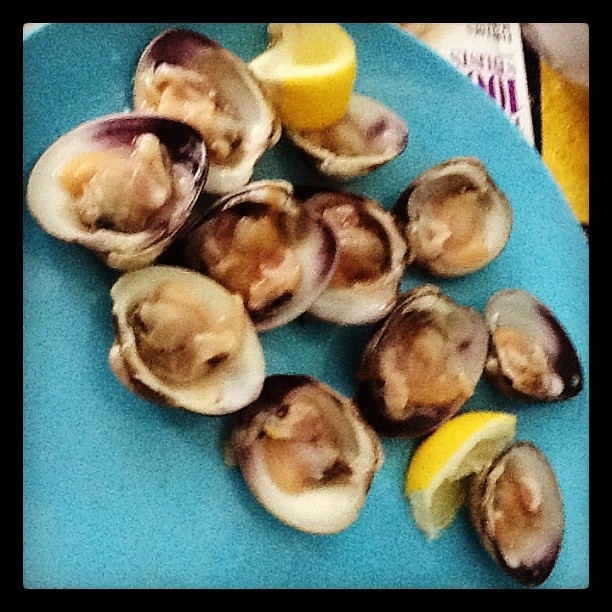 These clams were caught by his stepmom the day we arrived. You can eat them raw just like an oyster. You can steam them, or you can make clam chowder. My boyfriend’s step mom made a huge pot of clam chowder. Yesterday we had a lobster dinner with steamers, while watching the sunset. (I’ll tell you more about that later.) Tonight, in this photo, we are eating the little necks raw. Yum. I love seafood. This is why living on the east coast is so amazing.